Twenty years ago, Rambo made his last appearance in Rambo III. The movie didn’t give Rambo the departure he deserved. Many believed, even Sylvester Stallone, that another Rambo would never be made. However, Sylvester Stallone took it upon himself to produce, direct and write Rambo IV and give Rambo a film he could be proud of. In Rambo, Rambo (Sylvester Stallone) in still living in Thailand as a longboat operator and as a snake hunter. The first thing you’ll notice is that Rambo is angry. He has a grudge against everything. When a group of Christian missionaries ask Rambo for a boat river into war-torn Burma, Rambo refuses. He tells them if they aren’t going in there with weapons, they aren’t solving anything. Rambo finally gives in and decides to take the missionaries to the local village of Karen in Burma. When a group of mercenaries ask Rambo to take them to where he dropped off the missionaries, he becomes aware that the missionaries have been kidnapped. Rambo joins the mercenaries as he knows he is the only hope against Major Pa Tee Tint (Maung Maung Khin) and his sadistic soldiers. 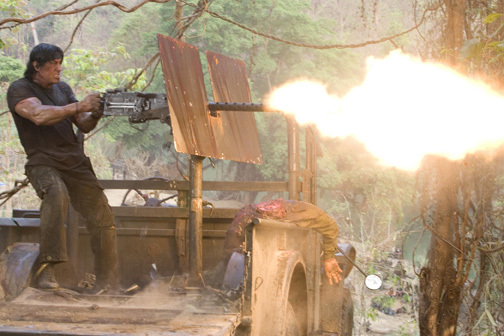 Rambo lives up to its expectations and ups the ante in both action and violent. At first it was shocking to see how each bullet and explosion showed the damage it caused the human body. Add to this that I watched it in Blu-ray high definition and I felt that was I in the middle of the war zone. I never new Stallone was such a good director. He did an excellent job handling the action sequence that movie required. Rambo look flawless in Blu-ray and I‘m giving the video a five star rating. The audio is dazzling and by far the best part comes towards the movie’s climax when all hell breaks loose and you hear the swarming of bullets in full surround sound. This 2-disk Blu-ray special edition also includes six featurettes, four deleted scenes, and a digital copy of the movie. Overall this Rambo does just about everything right. For those of you that missed it in the theater, you won’t regret taking a look at Rambo on standard DVD or Blu-ray. It’s a long road: Resurrection of an icon - Sylvester Stallone and others discuss how they came about the idea for Rambo. Interestingly, the first ideas revolved around Rambo in Mexico. (19:44). Deleted Scenes - Four deleted scenes are showing with the best of the lot being Boat Ride where Rambo discuses his private life and lets us into his mind set. Standard Definition Digital Copy of Rambo Feature film.